Chinese fried rice has always been a favorite of mine, but it’s a long process to get it right, to make it the way it’s served in restaurants. And during the week I like to keep meals as quick and simple as possible. You too? And so I figured, why not? Practically everything else can be made in a crock pot, right?. So I decided to give it a go: “Fried” rice made in the slow cooker. So here’s the thing – I get it, it’s not fried. But that’s what the name of the dish is and this is a slow cooker version of it, so…sometimes you’ve just got to take a little liberty. And that’s what I did. Will the rice be all mushy and clumped together in one big mass? No. Not if you use long-grain rice and don’t overcook it. Is the rice going to be nice and dry without a single kernel sticking to another? No. As I mentioned above, getting that restaurant consistency takes time and involves a totally different process. And the purpose of this version is to save you time on days you don’t have it but want to come home to a tasty, ready-made meal. I made this yesterday and everyone in my family enjoyed it. So if you like Chinese-fried rice and want a completely fuss-free, hands-off, one-pot version of it that cooks itself while you’re out and about and tastes delicious, then this is for you! 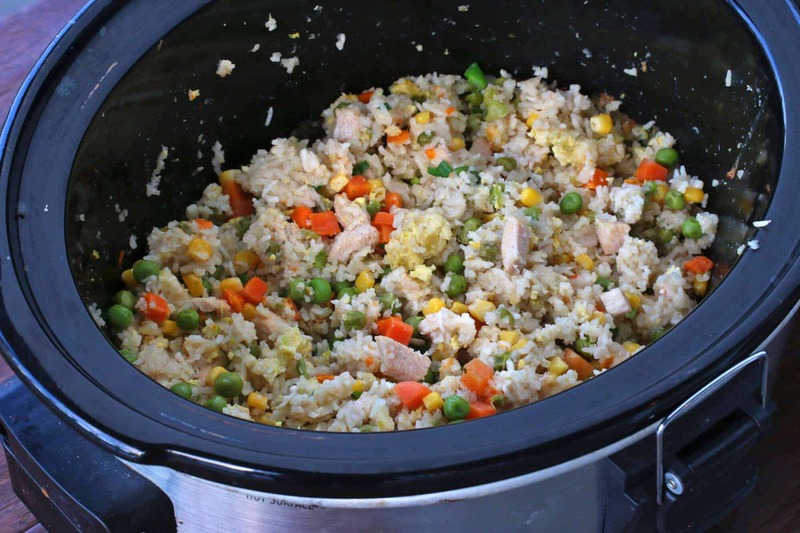 Place the chicken, ham, or pork (or tempeh) in a single layer in the slow cooker followed by the rice, veggies and garlic. Stir the soy sauce, sesame oil and salt in the chicken broth and pour the mixture over the veggies. Close the lid and let it cook on HIGH for 2 hours. Pour the eggs over the veggies, close the lid and cook for another 45 minutes. Stir the mixture, fluffing the rice with a fork and stir in the green onions. 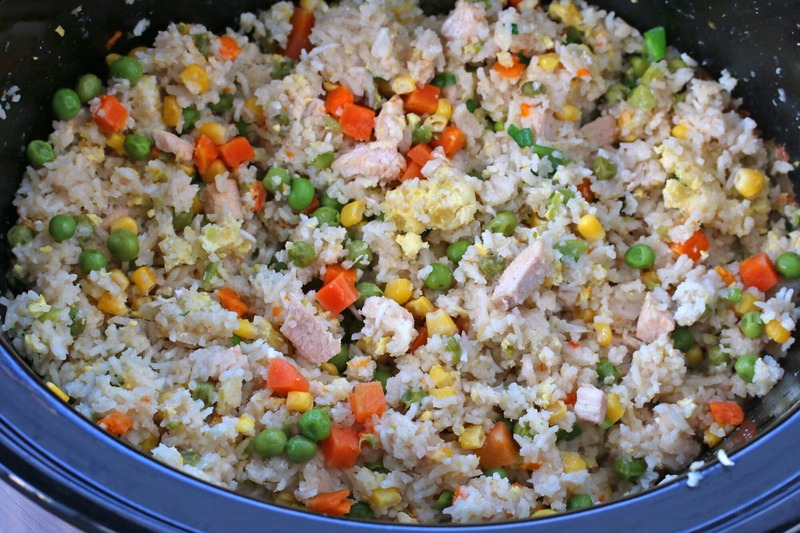 Enjoy this tasty Crock Pot Chinese Fried Rice! This time-saving version will have coming home to ready-made fried rice! Place the chicken in a single layer in the slow cooker followed by the rice, then the frozen vegetables and garlic. In a bowl, stir together the chicken broth, soy sauce, salt and sesame oil. Pour it over the vegetables. Cook on HIGH for 2 hours. Pour the eggs over the vegetables, close the lid and let it cook for another 45 minutes. Stir the mixture, fluffing the rice with a fork. Stir in the green onions. Serve with additional soy sauce and sesame oil. Love easy recipes like this in the crock pot! Makes life so much less stressful! This is a wonderful idea! 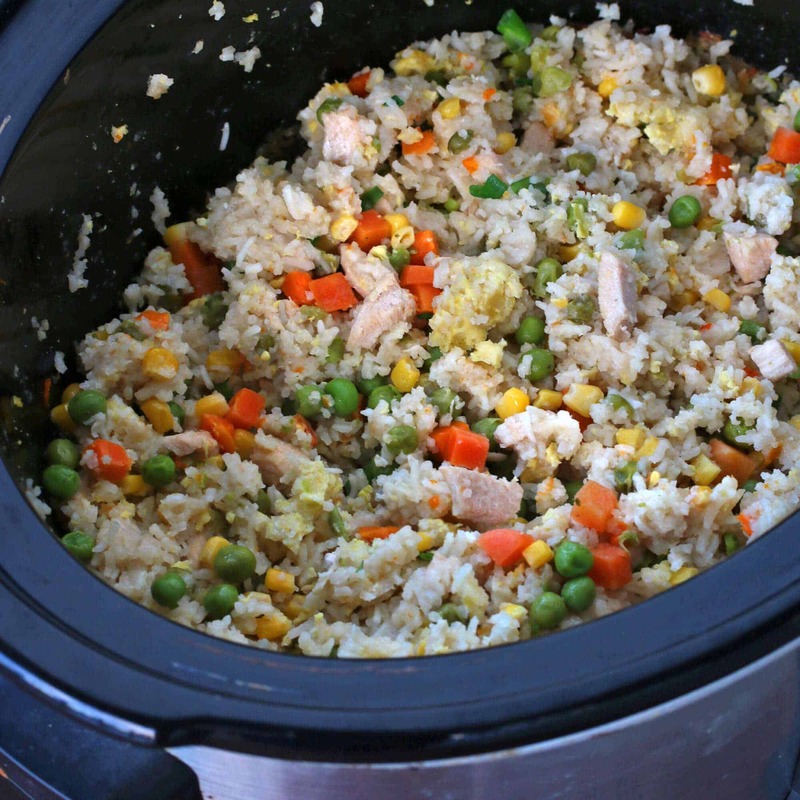 Who would’ve thought you could make fried rice in the slow cooker! Fried rice is a favorite of ours! Can’t wait to try this is a slow cooker! 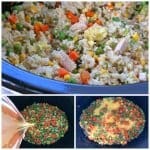 Such an inventive twist on fried rice – great idea! Ooo! 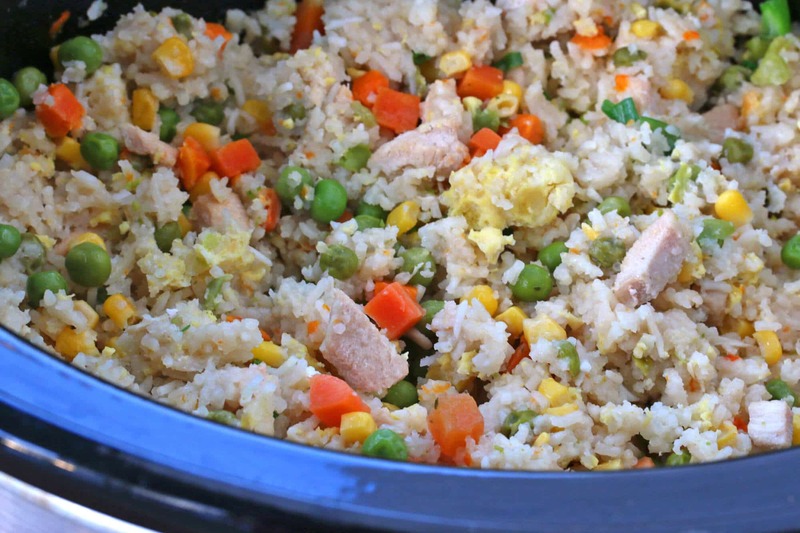 I’ve never made fried rice in a slow cooker! Can’t wait to try this! 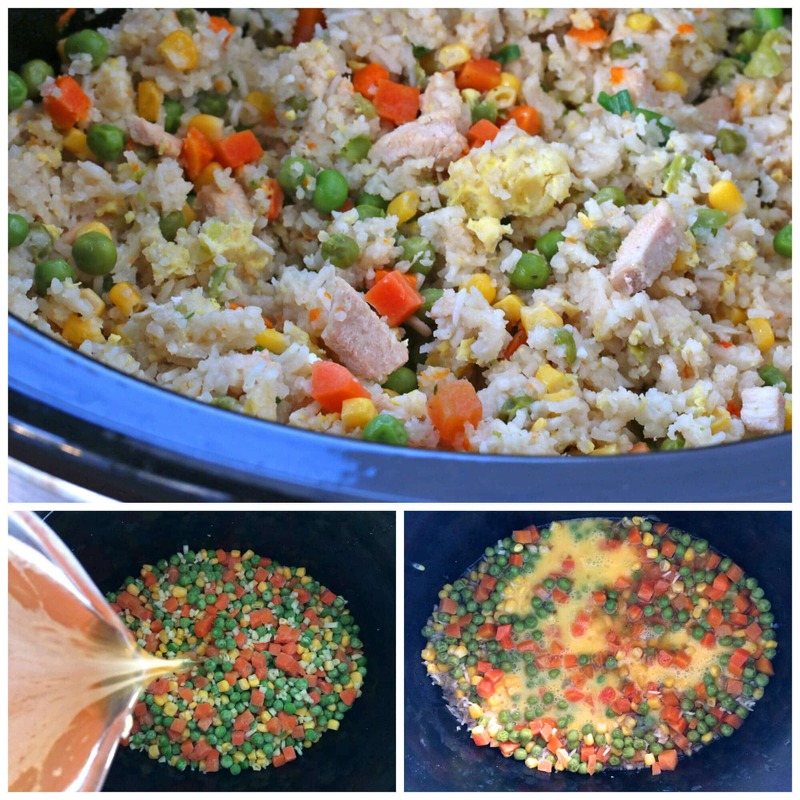 I just love fried rice!I’ve never thought of making it in the slow cooker…yous looks great! I love fried rice! Making it in the slow cooker is genius! I love that a slow cooker can do just about anything! This looks delicious! Anything made in a slow cooker is worthwhile! Would love to try this but, I would like to use shrimp instead of chicken. How do think this would work? Hi Claudia! That’s so funny, I was going to include shrimp as one of the options but not having actually tried it myself yet was hesitant to suggest it. Shrimp are so easily overcooked and become tough as a result. So what I’m thinking is to approach it in the same way as my Slow Cooker Jamabalaya and just place the shrimp in a single layer on the top during the last 15-20 minutes of cooking, then stir them in at the end. That way they’ll be cooked and remain tender. I too was worried about the shrimp being tough. I will try it as you suggested and put the shrimp in last. Thanks for the help, love your recipes. A great idea; I am going to try this, this week! This is awesome. I NEVER would have thought it would work. Thanks for testing it out for the rest of us. Can’t wait to try this version. Ooooo this would be so good for dinner this weekend! I want to try adding shrimp too! How does it freeze? If’n Leave out the eggs,perhaps better? I made this for dinner. It’s quite tasty. I included diced capsicum and celery. Ininkybinlicde bacon and no other meat. I didn’t use onion or garlic due to IBS. The method doesn’t state when to include the soy sauce so I added it along with the stock. It has turned out pretty well and I will certainly make this dish again. Thank you daringgourmet. 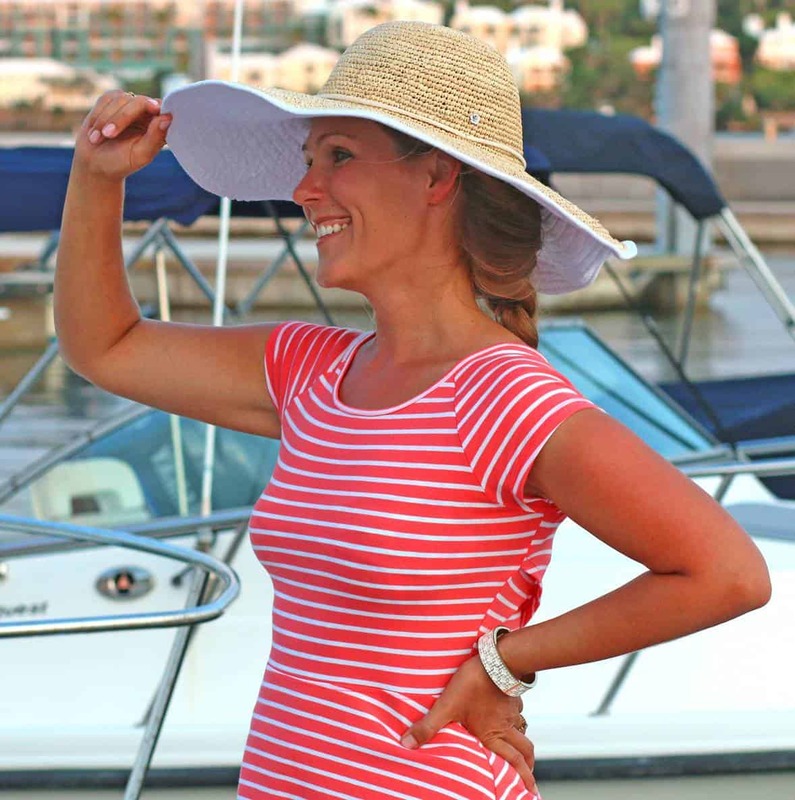 Wonderful, Marg, thanks so much for the feedback! The soy sauce is included with the chicken stock in the pictured recipe instructions but I forgot to add it in the recipe box instructions, thanks for catching that. I’m not sure what I’m not doing well, but for some reason the liquid just doesn’t want to cook off. Mine didn’t turn out well either. After 2 hours on High, the rice wasn’t cooked and there was a ton of liquid still. After another hour, the liquid was mostly absorbed and I had a pot full of mush. :( On a good note, the rice that was on top was edible and the flavor was very good. But there wasn’t enough to feed my family so I had to make something else. I tried this recipe today. It was wonderful! Has anyone made this with something other than Jasmine rice? I am afraid my picky children wont eat it.